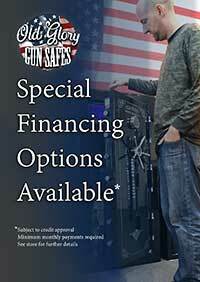 Gun owners love gun safes from Old Glory Gun Safe Company! It’s easy to see why, given the state-of-the-art materials and construction techniques we employ in each and every gun safe, the resultant rock-solid reliability, and the incomparable peace-of-mind that comes from knowing unsupervised kids won’t be playing with the guns, criminals won’t be getting their hands on those firearms that you have worked so hard to earn. But don’t just take our word for it. 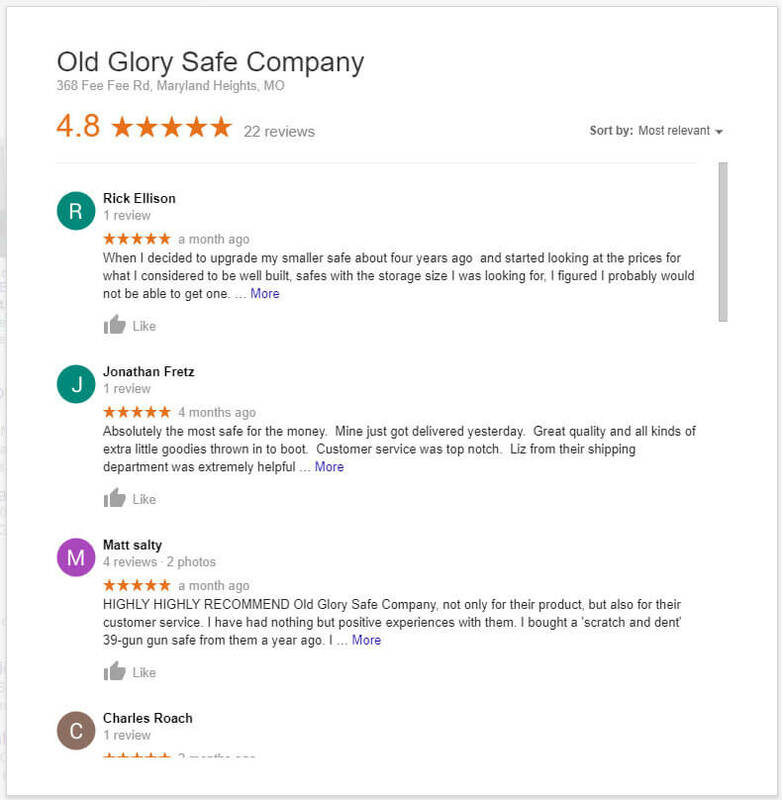 Read what happy, satisfied gun owners have to say about the gun safe they acquired from Old Glory Gun Safe Company. "Just received this fantastic 39 gun safe in perfect condition! This is the real deal folks! I cannot say enough positive things about this whole transaction. The product meets all their claims to the tee and literally blows away my expectations. From the million-dollar finish to the pure massiveness of the body and door with its 20 heavy bolts it says quality, quality, quality! Not to mention a high level fire rating found only in products many times its cost. And then there has been the fantastic customer service from my first call to the free shipping with outstanding coordination and fast delivery. So if you need a real safe rather than a gun cabinet this choice is a no-brainer." "I love this safe. It's beautiful and 1st quality. What's more impressive is the customer service by both Liz and Michael were exceptional to deal with. Answering late afternoon emails, late phone calls and not making the whole process so uncomplicated. These 2 know what service is and means to a customer. Who knows if I'll ever need another safe but if I do I know where it will come from. I have already recommended this to three people. Thanks again guys. A pleasure doing business with ya." Was able to get it up the stair to the bedroom closet. Filled with guns that heavy gun safe isn't going anywhere. The indoor delivery is a good idea. One of best safes l ever bought it looks nice it heavy to move and when it comes time for another i will by an old glory again thanks Michael. I really like the gun safe I received very nice quality. Great customer service! Even better free shipping! Just received this fantastic 39 gun safe in perfect condition! This is the real deal folks! I cannot say enough positive things about this whole transaction. The product meets all their claims to the tee and literally blows away my expectations. From the million-dollar finish to the pure massiveness of the body and door with its 20 heavy bolts it says quality, quality, quality! Not to mention a high level fire rating found only in products many times its cost. And then there has been the fantastic customer service from my first call to the free shipping with outstanding coordination and fast delivery. So if you need a real safe rather than a gun cabinet this choice is a no-brainer. You said it was the heaviest gun safe I have ever seen and you were right. Thanks for the great service. Ordered the 24 gun safe and i am very happy with it. Looks very nice. Customer service was unbelievable. Very nice to talk to. They answered all my questions. This is a great safe and a great price. Safe was delivered in excellent condition and very quick. Would recommend this company to all. Love my Old Glory Gun Safe! I had experience with a lot of my friends gun safes, nothing like my safe with it being 800 lbs, 20 locking bolts and the over-ride. We will recommend to everyone who wants a serious gun safe. We love our Gun Safe it's over 1100 lbs. it ain't going anywhere! 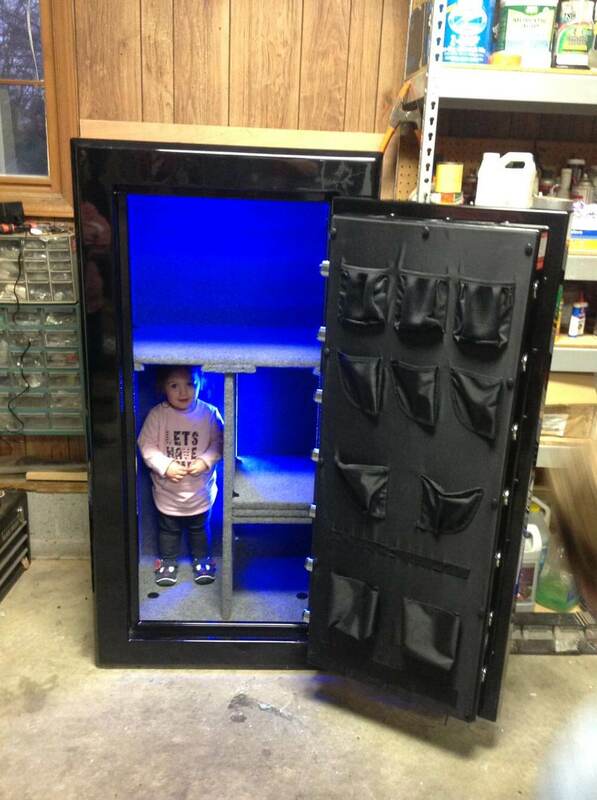 "My little granddaughter thinks my new gun safe is very cool.....and so do I!! It arrived right around Christmas. I have already put it to good use"